They have left big paws to fill! We will certainly miss Jackie and Josephine and all their contributions! ENJOY your well-earned retirement! Kathy Rakestraw retired her girl Cori yesterday. Cori's going to be 11 very soon. Kathy has a lot of changes going on in her life so she decided to retire Cori. But yesterday Kathy actually saw from her that’s she’s ready to retire. She wasn’t as engaged as she normally is. They will miss their friends and the kids at RT Jones but Karen Cobb and her boy Norman will taking over so Kathy and Cori can rest easy. Kathy and Cori, THANK YOU for all you have done. You have definitely made a difference in all the many young lives you have touched over the years you have served. 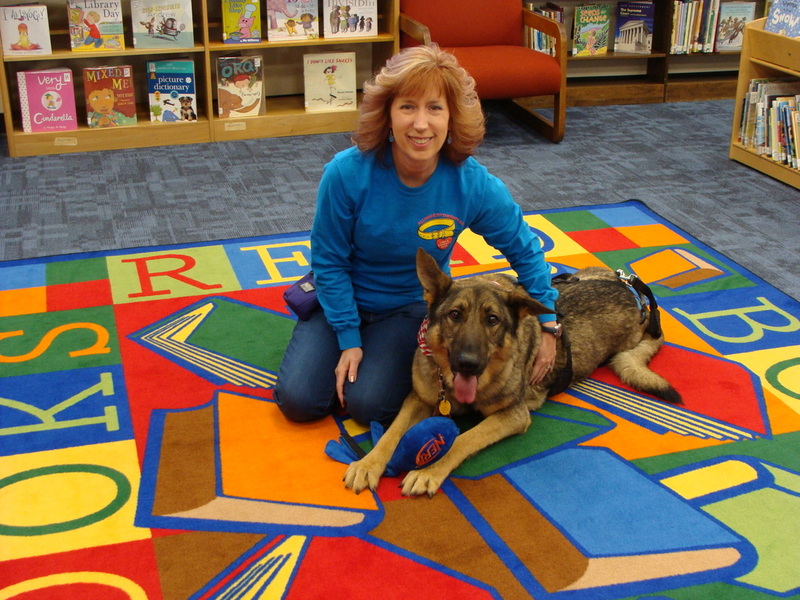 Molly Young and Moose have been serving as READing partners at the Fayette Co Library since Sep 2012 (72 visits). 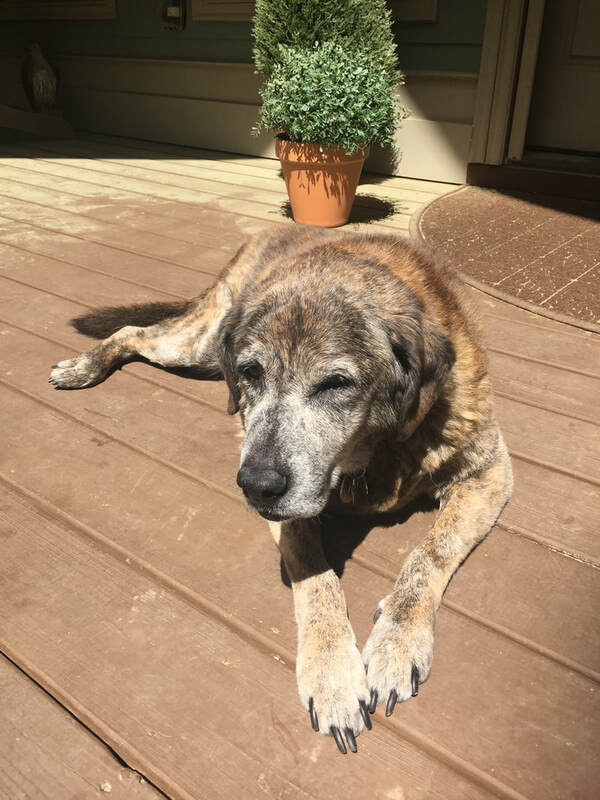 Moose was a lover of all and the best listener. 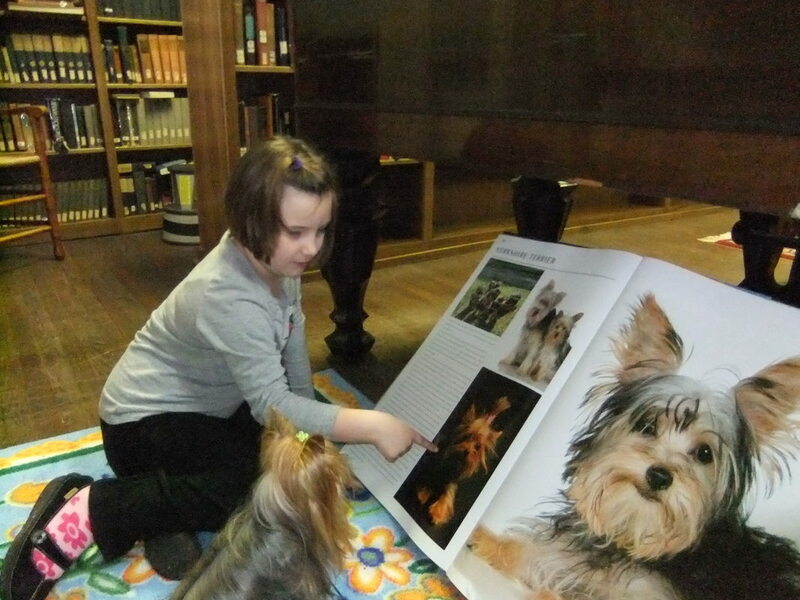 Kids loved to tangle their fingers in his fur while they read stories of all kinds. He was good at jumping into the middle of chapter books for the older kids and scanning the pictures for context clues to help the younger kids. 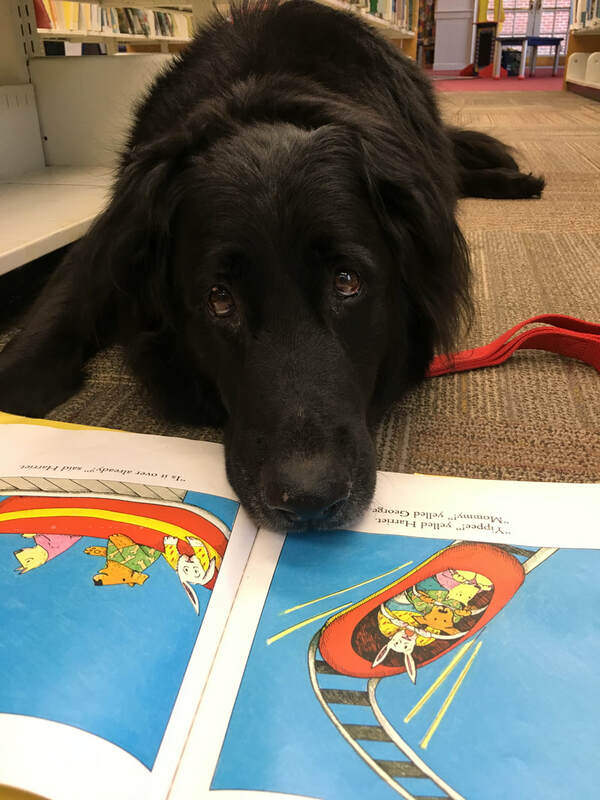 Moose made sure all kids and adults were welcomed with a wet nose in the Fayette County Public Library's Children's Department. 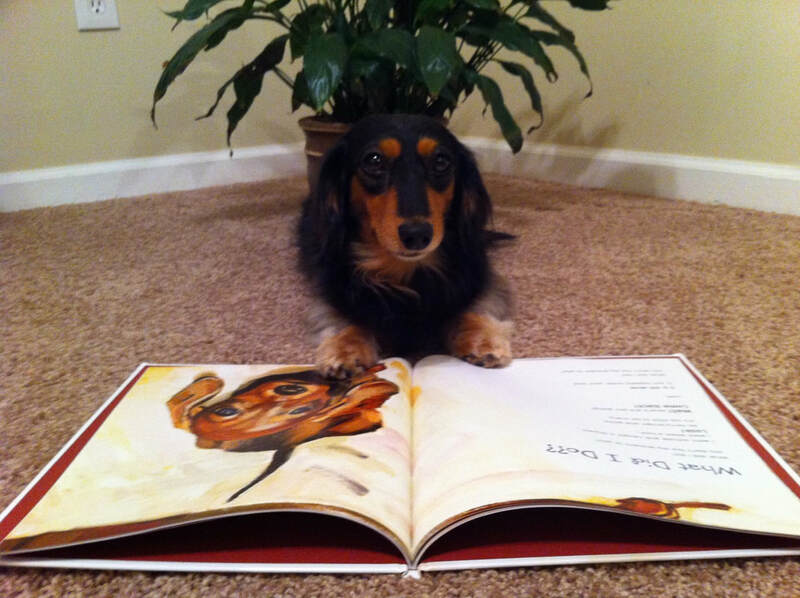 He was always eager to encourage kids to keep reading. Molly has attached a few pictures from some of their memories that she's posted to FB over the years. Can't believe it's been 6 years! Molly Young and Moose, we will miss you! THANK YOU for all your many years of service and for helping kids learn to LOVE reading!!! 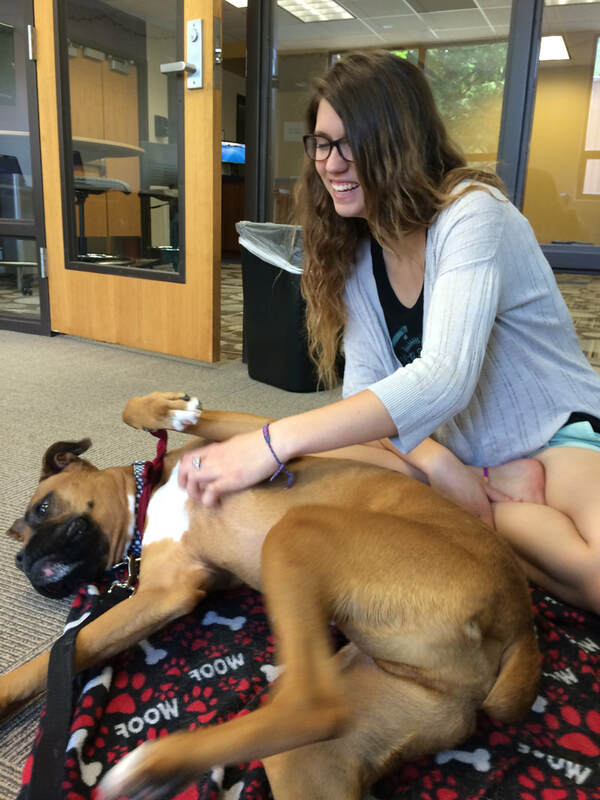 ​Sparty began her work with CAREing Paws in 2014. She brought joy to people in nursing homes, children in the hospital, troubled teens living at a behavioral health facility and youngsters practicing their reading at the library. 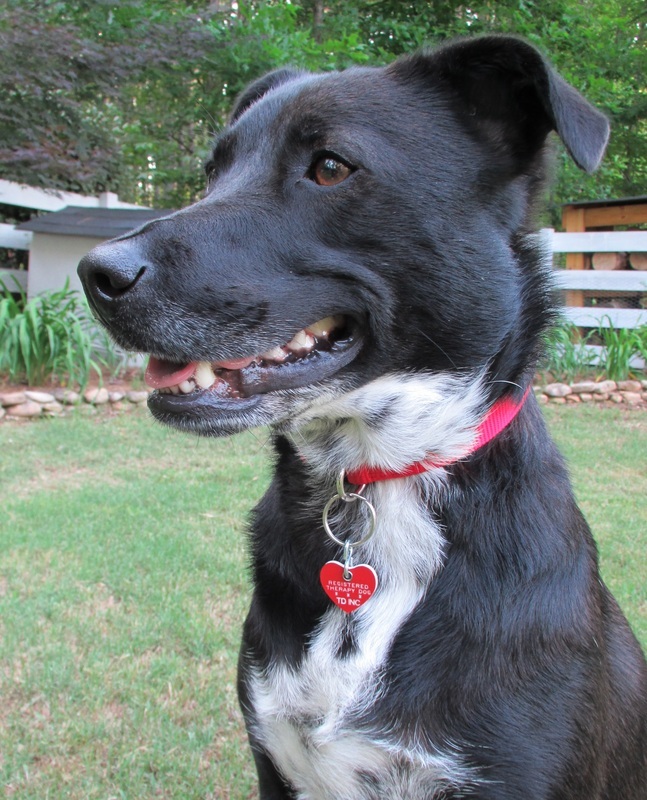 Sparty came to CAREing Paws about a year after being found abandoned on the side of a road in Dallas, Georgia. 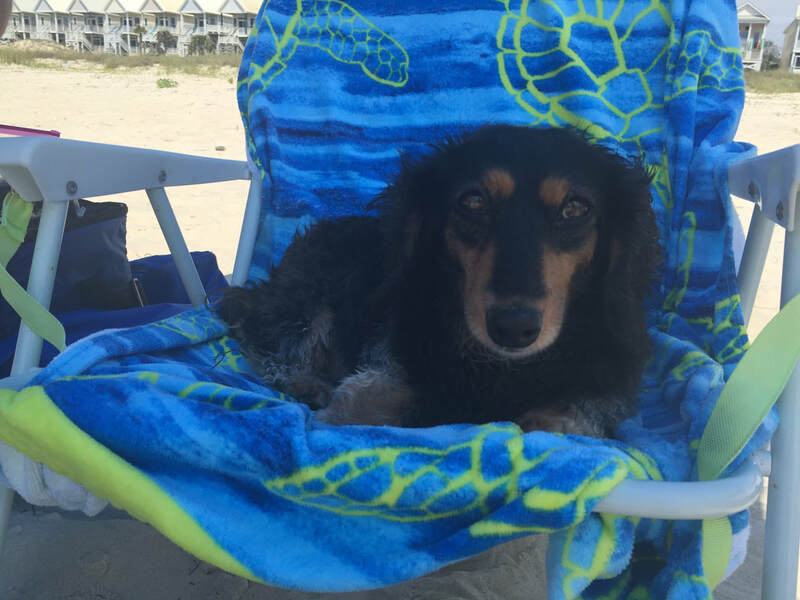 She got her second chance at a rich, full life when she was taken in by the DREAM rescue program for dachshunds and then adopted. Sparty was always so excited when we pulled into the library parking lot and she was known to do her "Sparty shake" on the floor when she was happy, which made the kids laugh out loud. Sparty is retiring knowing she made a difference in the lives of many by showing them the unwavering love and support only a dog can give. 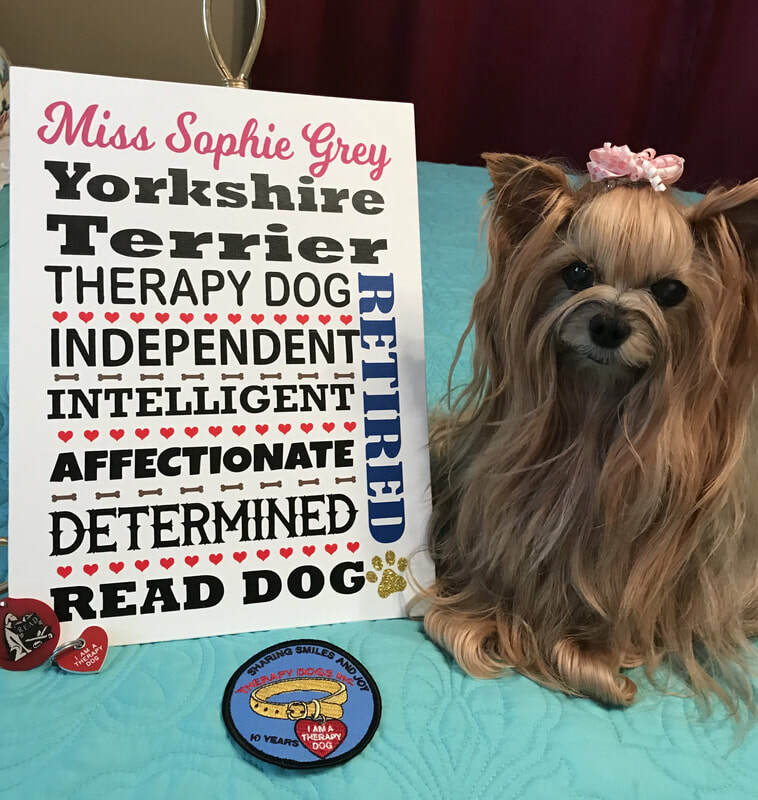 ​Miss Sophie began her service as a therapy dog in 2008 and R.E.A.D. in 2009. She visited nursing and veteran's homes, assisted living and Alzheimer's facilities as well as schools and libraries. 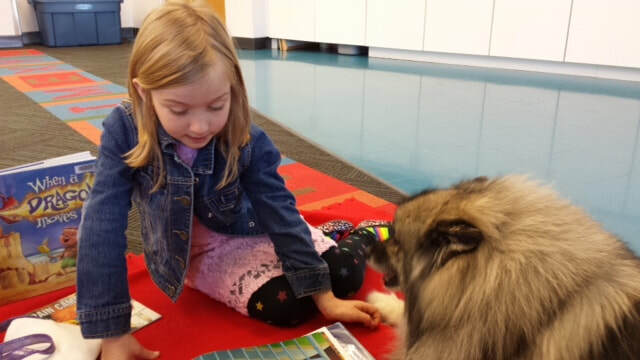 She started a READing program "4 Paws and a Book" at local historical library where children came to read with her each month. 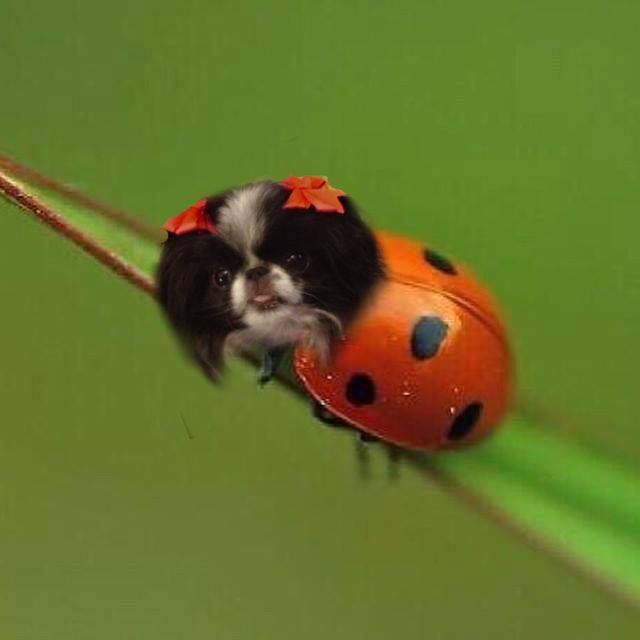 She loved everyone she met and everyone loved her! 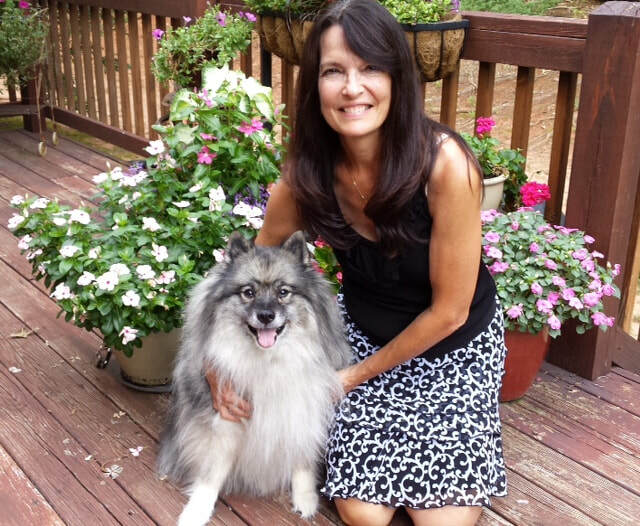 She was inducted into the Alabama Animal Hall of Fame by the Alabama Veterinary Medical Association in 2010 for her work as a therapy and READ dog. ​Sweet Jen is retiring! JEN (BL'S Jens Chex) came to Sandra Rowden Miles when her "person" passed away in 2010. She was born 3/29/2005 and raced in Florida. She has been a member of CAREing Paws for about 3 years. 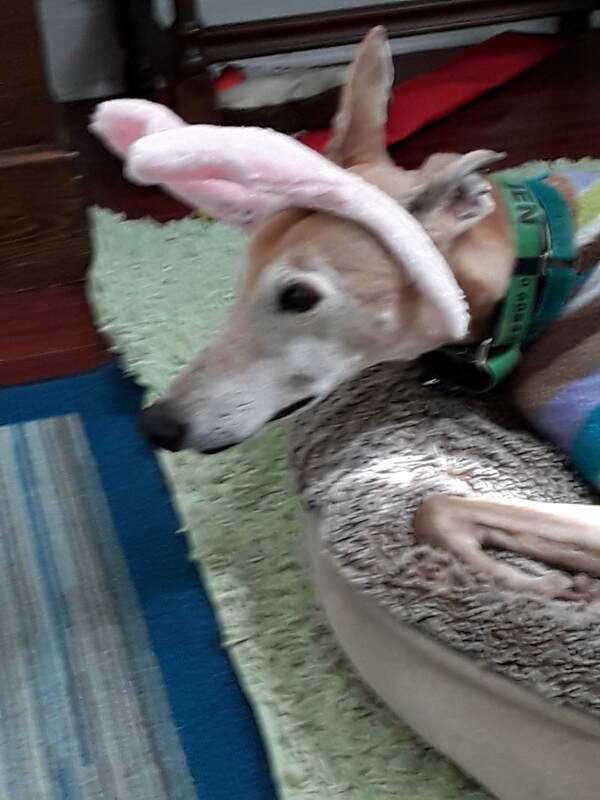 She really started visiting nursing homes and Egleston (CHOA) about 7 years ago for Southeastern Greyhounds. 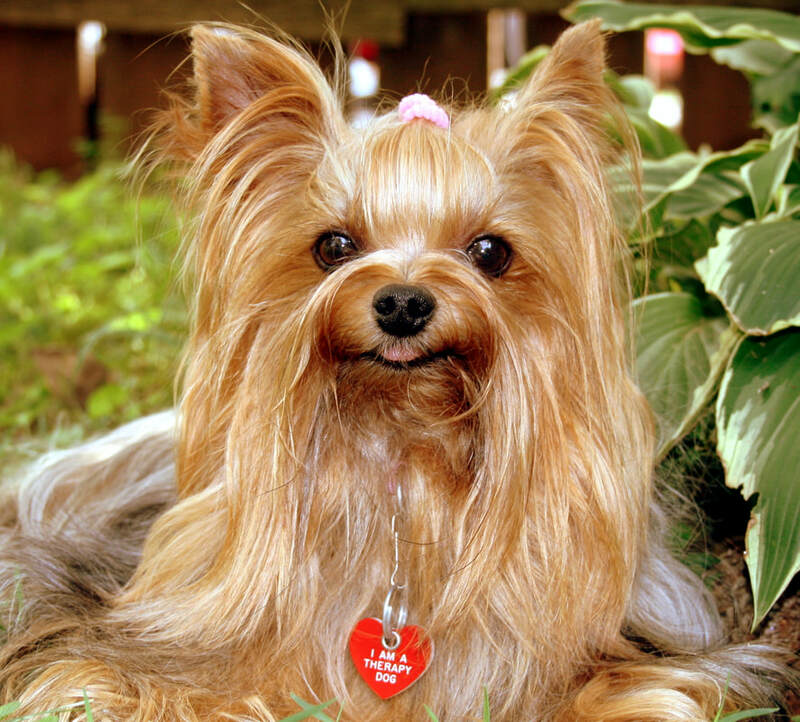 She has done many, many meet and greets for her breed. She loved visiting with children and adults everywhere! 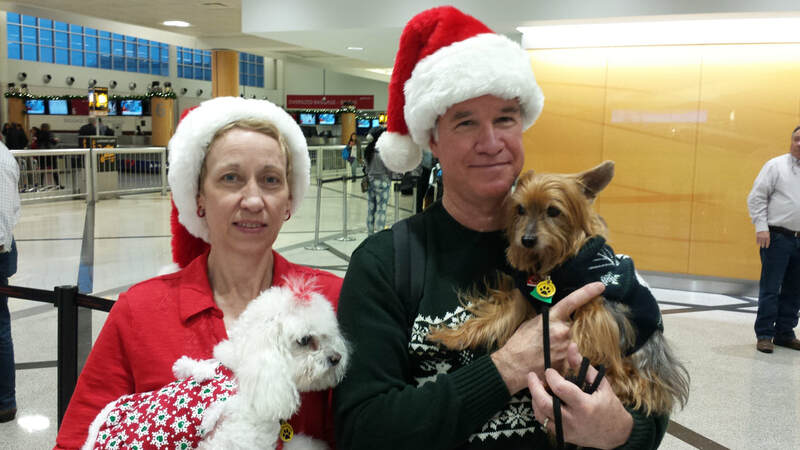 She was a big hit at Piedmont Fayette and the airport. She is now retired and races in the yard with her sisters. THANK YOU to Sandra Rowden Miles and Jen for all your many years of service as a Therapy Team! 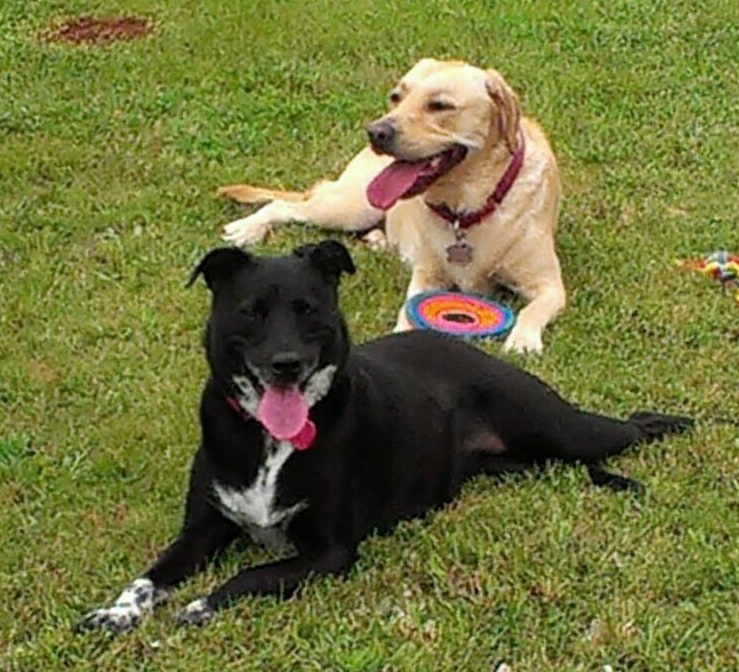 Sandi is continuing to visit with Jazz, who is following in her sister's pawsteps! 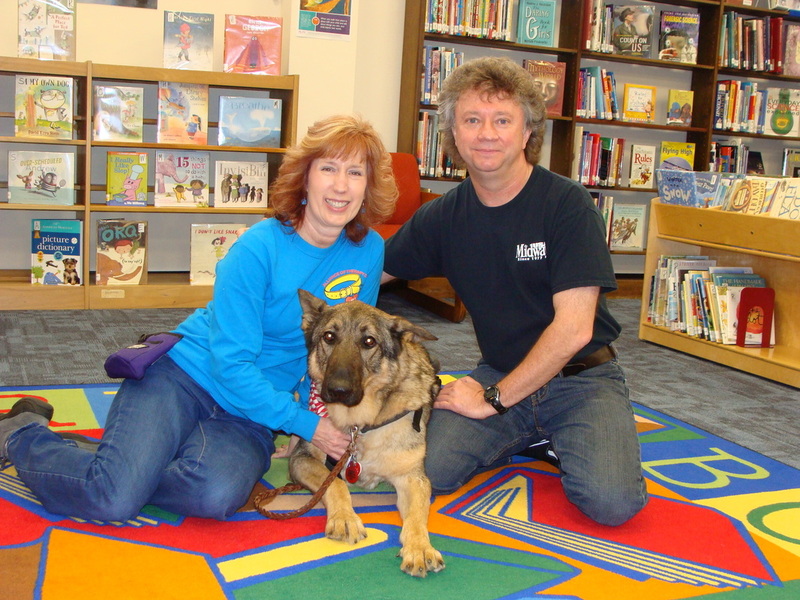 ​About five years ago I read an article in the "Living Section" of the AJC about children that read to a dog at the Marietta Library. 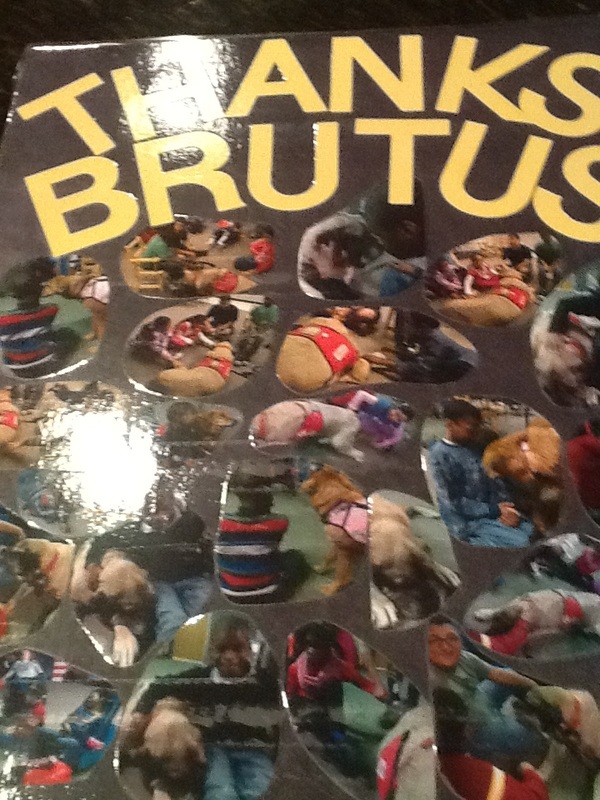 When I finished the article there was a woman to contact if interested becoming involved in this pet therapy program. The contact's name was Melissa Saul. I'm so glad I picked up the paper that day! 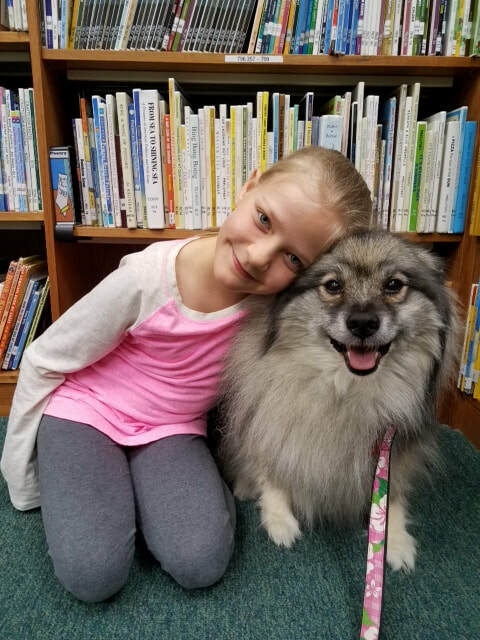 After reading the article I thought this would be a good fit for myself as a former Kindergarten teacher and our four year old Keeshond, Josie. First of all, I am so grateful for Melissa for putting her heart and soul into CAREing Paws and the R.E.A.D. program. We wouldn't be able to do what we do as members of CAREing Paws without her dedication and guidance. 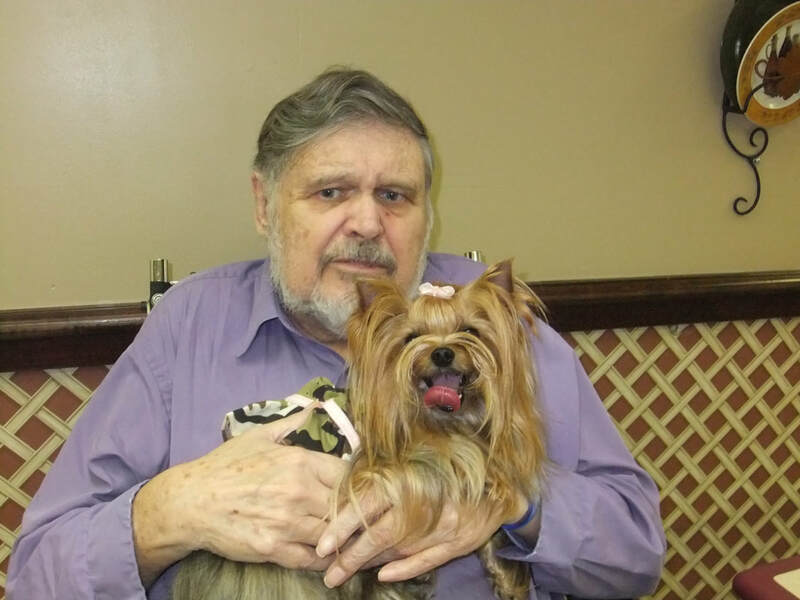 There seems to be daily opportunities to share the comfort and love of our dogs to a challenged reader, a hospital patient or a resident of a memory care facility. 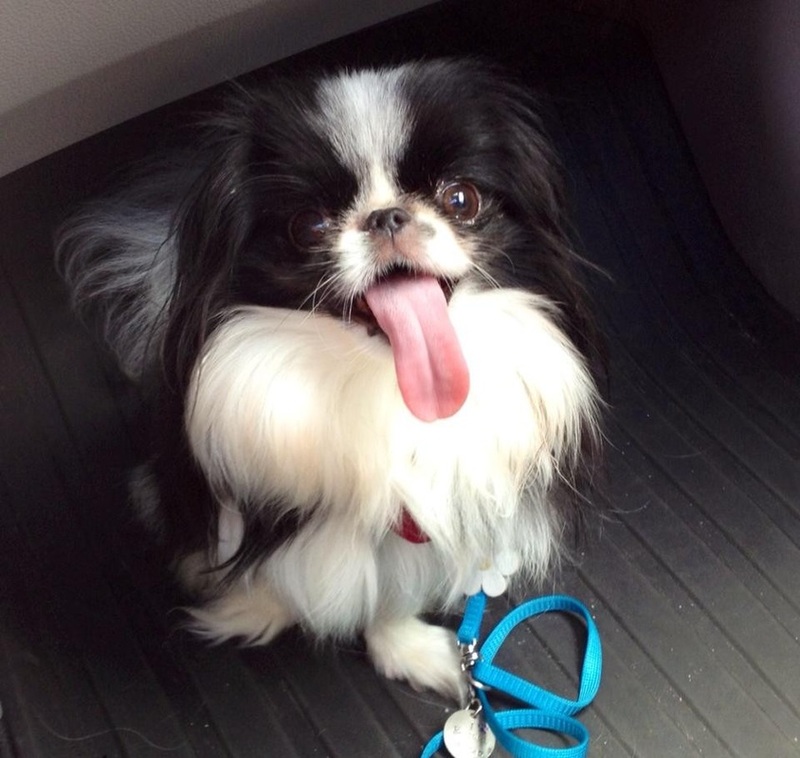 Pet therapy knows no bounds, this is what I have learned over the last five years. I have included some of my favorite pictures over the years. 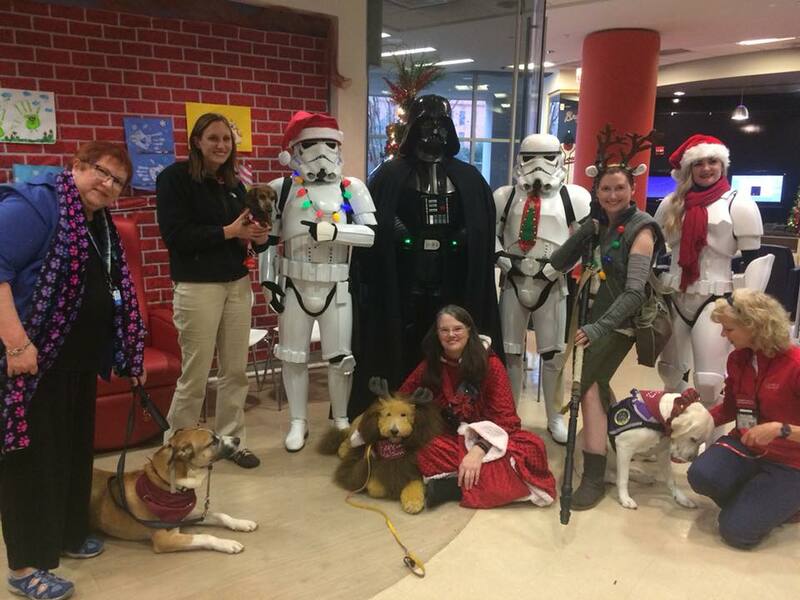 I will truly miss the relationships with other handlers, their precious pups and our many visits from Crabapple Lane Elementary to Georgia Tech to Hartsfield-Jackson Atlanta International Airport. These are moments I won't forget. ​After over 200 visits in six years, Bingo retired in January 2018. When we adopted him at 6 1/2 years of age he didn't know a single command. 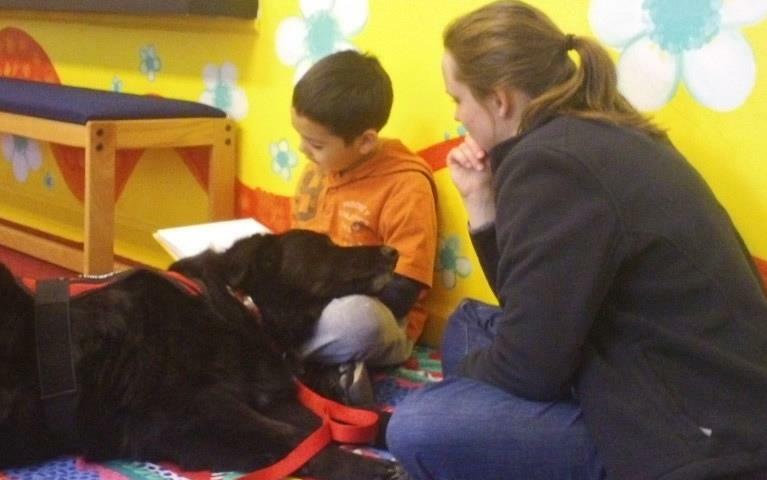 He quickly learned his obedience skills, and we knew he had the temperament to be a great therapy dog. 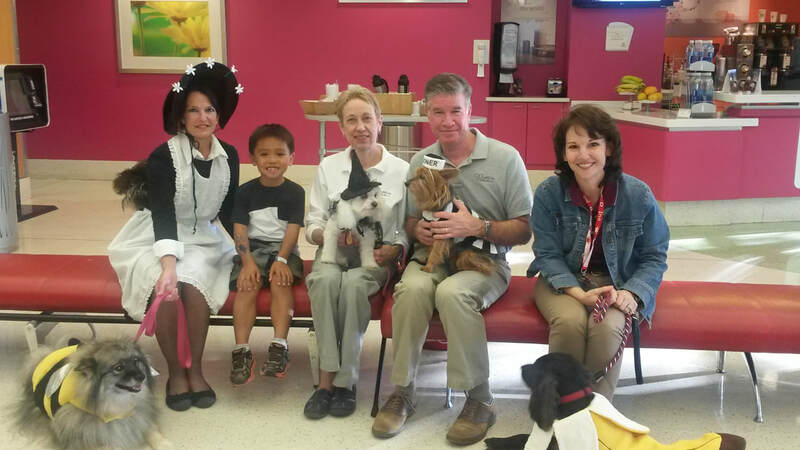 Bingo visited many facilities, including Anchor Hospital, Ridgeview Institute, Hartsfield-Jackson Airport and Scottish Rite. His specialty was giving kisses - LOTS of kisses. His calm, laid back demeanor and small size put many clients at ease. Although he would be happy to try, chronic back pain and general aging issues made it increasingly difficult to continue his therapy work. We are so proud of our special man! After two years volunteering with CAREing Paws in the R.E.A.D. 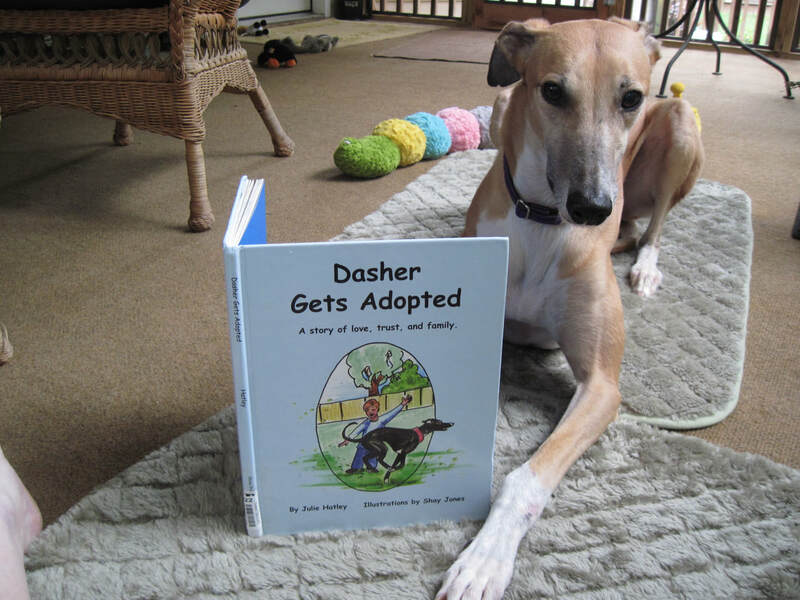 Program, Miller decided it was time to retire and be a stay-at-home dog. During their time as a therapy team, he and his mom, Sarah, worked with children at Burch and Palmetto Elementary Schools. 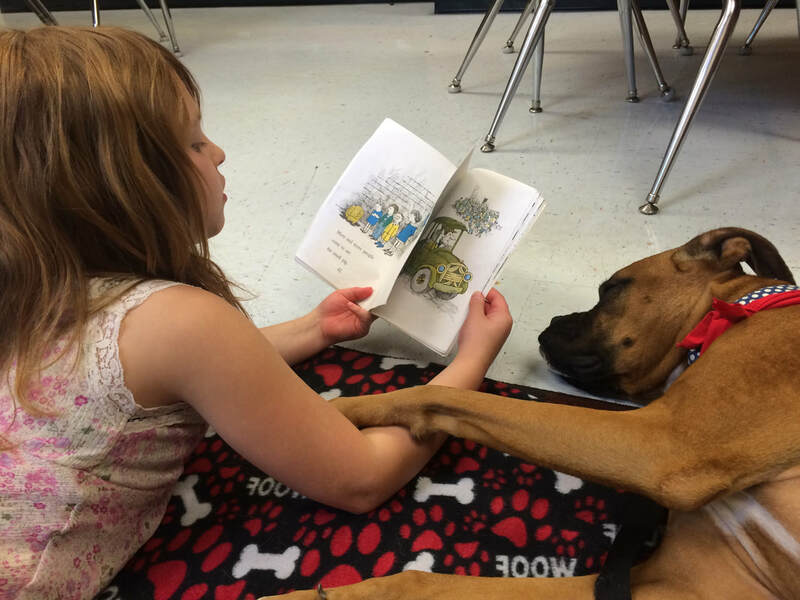 Miller loved listening to the children read and getting belly rubs from them, too! He worked with one little boy who’d been through a lot of personal trauma and had been very negative about school. He rarely smiled or engaged in the classroom. About two-thirds of the way through the school year of visiting with Miller, the little boy bounced into his classroom with a big smile and announced to his teacher, “I decided I like school now.” The teacher asked why, and he replied, “Because of Miller!” Miller and Sarah also did a special session to teach the entire third grade at one school about working dogs. The students were very interested in Miller, wanting to know how fast he could run (in miles per hour) and whether he was married! Miller also enjoyed his college visits at Point University, where his mom teaches. 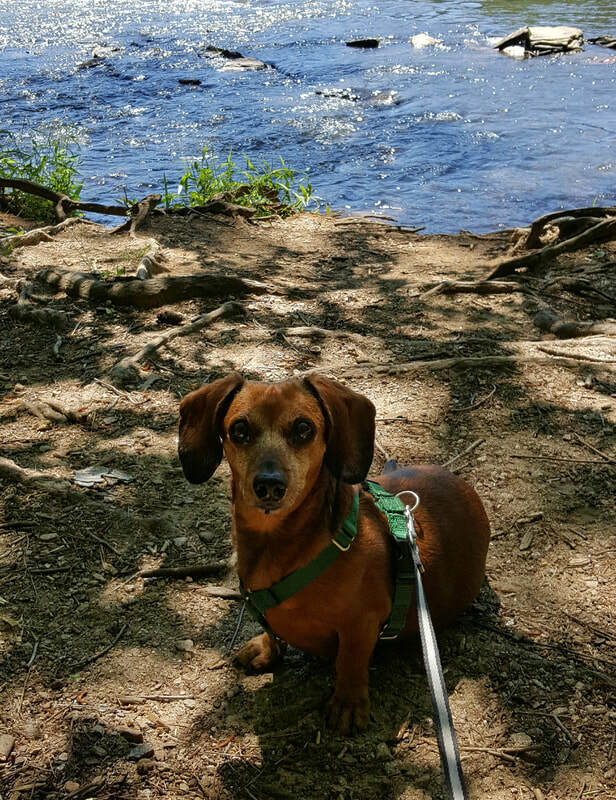 In retirement, he is enjoying hiking, playing with his favorite toys, and sleeping a lot! 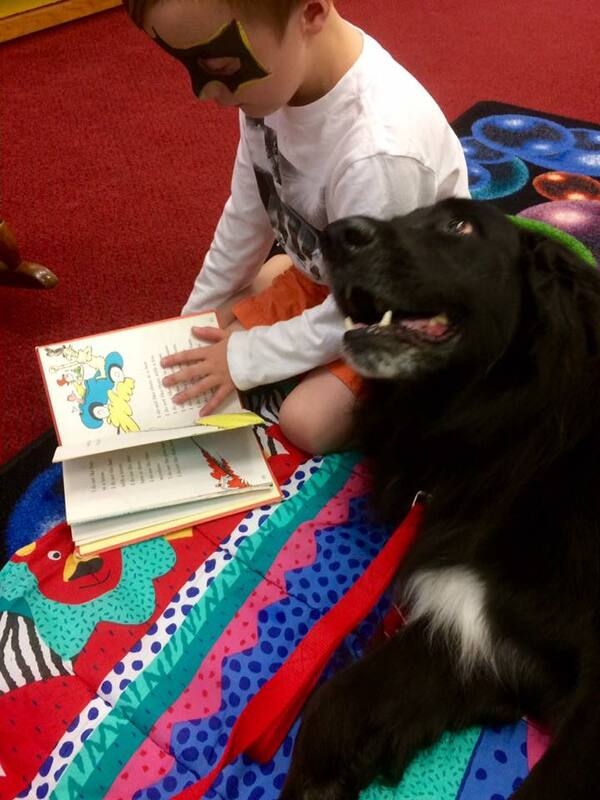 ​On February 13, 2016, Taka, Jamie Ward's therapy dog and Reading Education Assistance Dog (R.E.A.D. ), retired from his distinguished therapy career. Taka and Jamie started therapy work in 2008 visiting the local veterans’ home, nursing homes and Alzheimer care facilities. They retired at the Redstone MWR library in Huntsville, AL where they served for over 6 ½ years (July 2009 – February 2016). The Tales with Taka reading program began immediately after Taka and Jamie became a registered R.E.A.D. team. 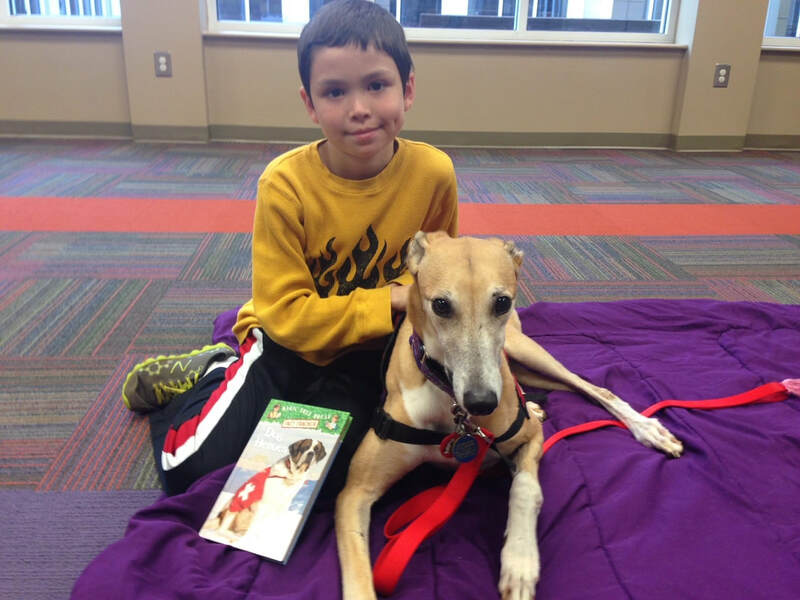 When they began the library program at Redstone, they found that Taka’s special gift was being a listener. He truly loved going to the library to hear the wonderful stories from his readers. Taka assisted many a shy or timid reader and helped build confidence and literacy skills in each of his readers. 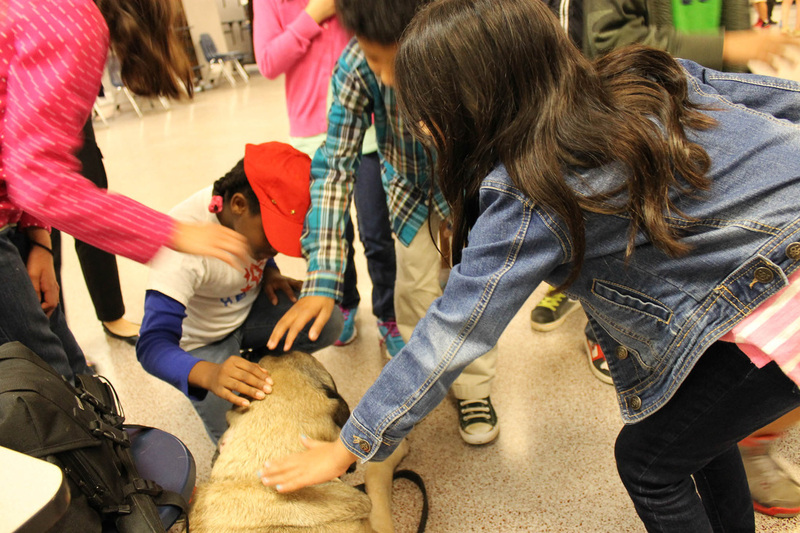 His gentle nature and sweet spirit were also catalysts for educating children in how to interact safely with dogs. 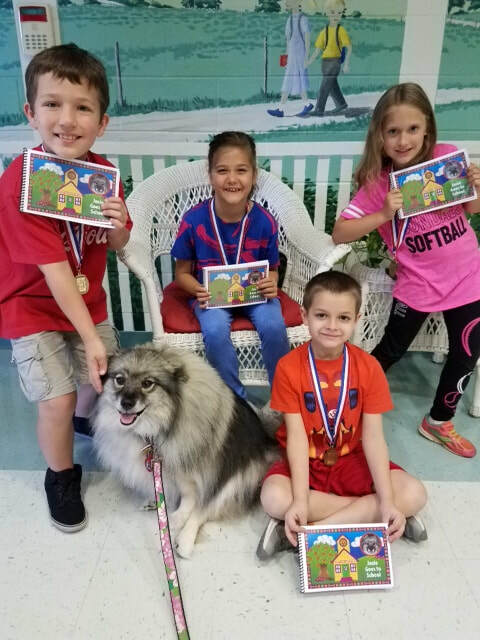 One young reader was terrified of dogs in general; however, Taka’s patience and gentleness helped this young man and his younger brother overcome their fear of dogs. 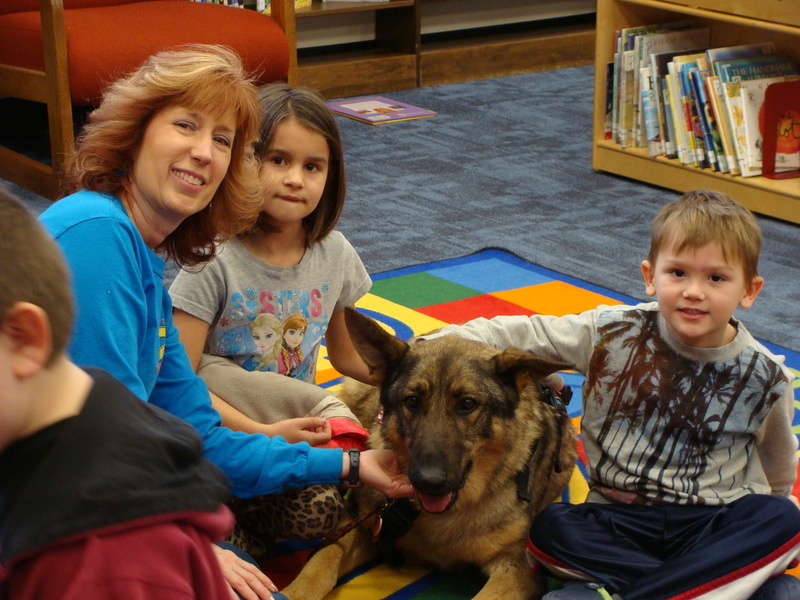 Young soldiers who visited the library would often share stories or reminiscence about their dogs while they visited with Taka. Over the years, Taka and Jamie also conducted reading programs at Marshall Christian Academy in Albertville, AL, Brownwood Elementary in Scottsboro, AL, and the Tillman D. Hill Public Library in Hazel Green, AL. Taka has patiently and lovingly listened to hundreds of readers during his service. 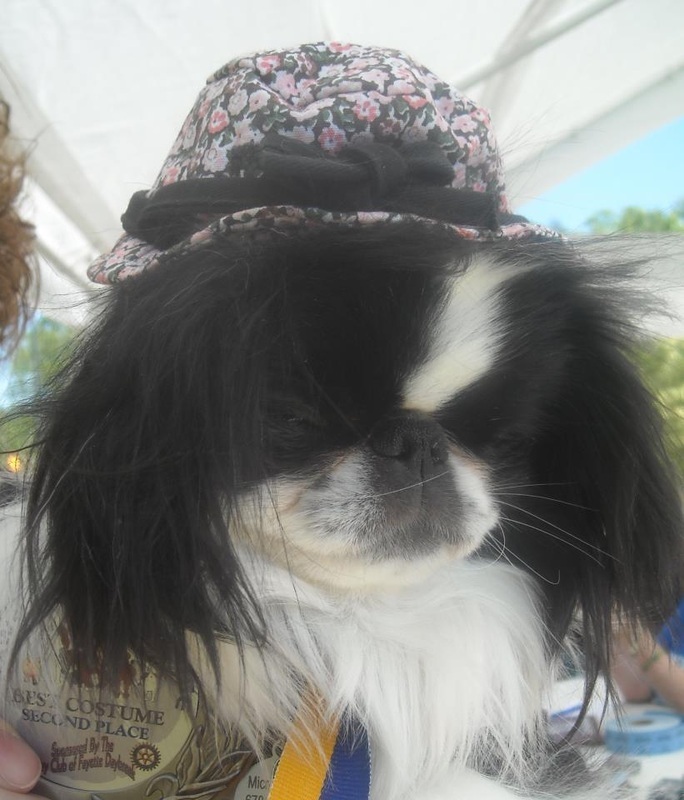 In 2010, Taka was inducted into the Alabama Animal Hall of Fame. It was a great honor to be included as a member for his therapy work. He was awarded a Commander’s Coin, an appreciation certificate, and Department of the Army retirement certificate for his dedicated and faithful service. He even received a self-authored book from one of his young readers called, “Super Taka.” This young reader was only a toddler when his older siblings began to read to Taka. Now, he has read to Taka and earned achievement medals and a trophy for reading. Jamie is so proud to have been Taka’s partner during their numerous therapy visits as she was fortunate to see the many smiles, hugs, and kisses both given and received. Yes, there were tears from many when Taka retired, but they were tears of joy in celebrating the friendships and hearts that Taka has touched and the joy of reading that he gave to so many. Jamie said "If we have encouraged even one reader to love books and libraries, then I am confident we have completed our mission to improve children’s literacy. Who knows, maybe we have been an inspiration for some of our readers to become teachers, librarians, or even future writers and authors." 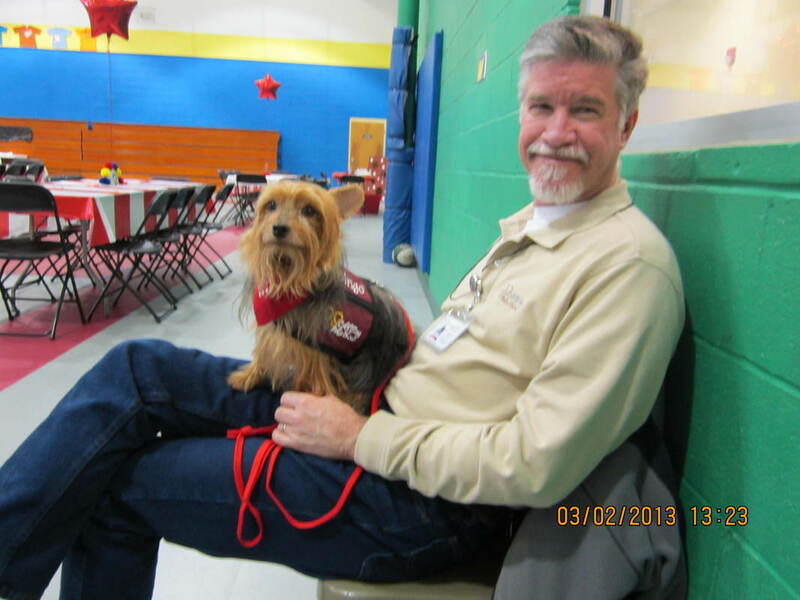 ​Diesel, and his dad, Denny Young, are a registered therapy dog team with Alliance of Therapy Dogs and CAREing Paws. 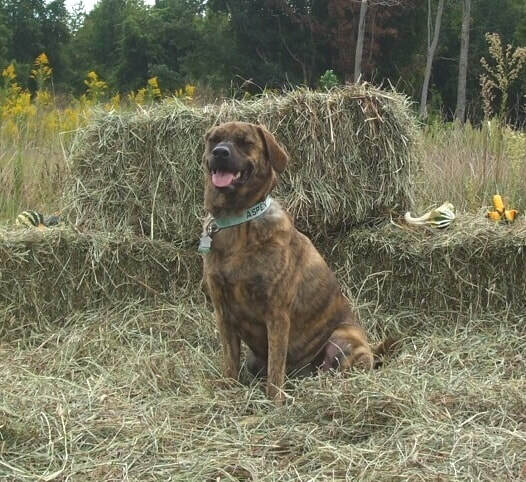 Diesel was registered at age one and immediately went to work in South Carolina. During his career there, Diesel became "staff" credentialed at the local Shriners Children Hospital, visited a children's group home, behavioral rehab center, the VA hospital and participated in a school reading program. Diesel and his family then moved to Georgia where he began visiting a local nursing home and shared smiles and joy for four wonderful years. 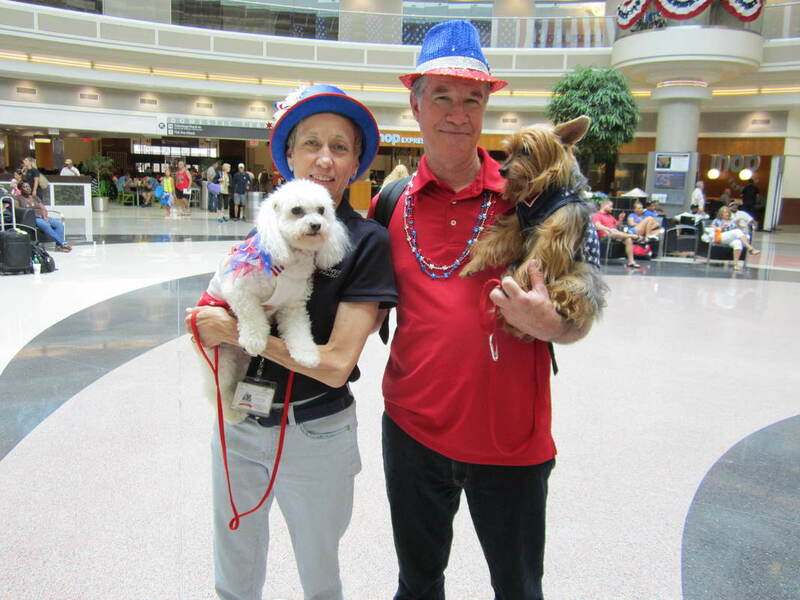 Denny and Diesel participated in the initial Atlanta Airport Therapy Dog program and soon became an approved member of the Hartsfield-Jackson Atlanta International Airport therapy dog program where they visited regularly. Diesel is the 1st (and only) dog in America to be credentialed to use a cart in conjunction with therapy dog work. He’s brought joy to many children by giving them cart rides at a children’s’ bereavement camp and at a summer library program. 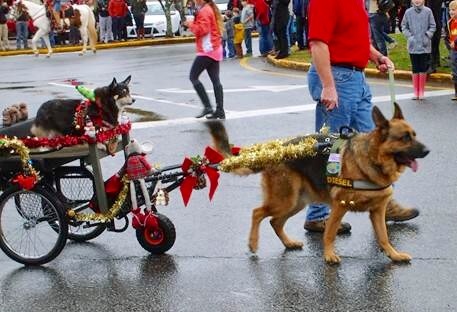 Diesel proudly pulled his beautifully decorated cart during the Dahlonega Christmas parade and made deliveries of presents to a teen group home during the holidays. 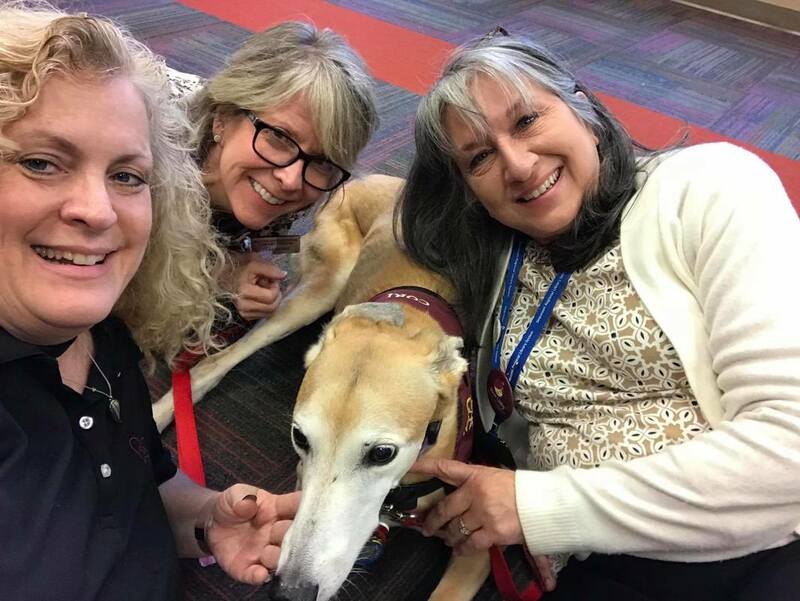 In addition to his therapy dog work, Diesel was the official mascot/volunteer for the Pickens County Sheriff's Auxiliary participating in many fund-raising and public relations activities. He will always be the loving, loyal and constant animal companion to Denny & Deanna Young. Katie and her Mom, Robin Sockness, were a registered team with TDInc. and volunteers with CAREing Paws. 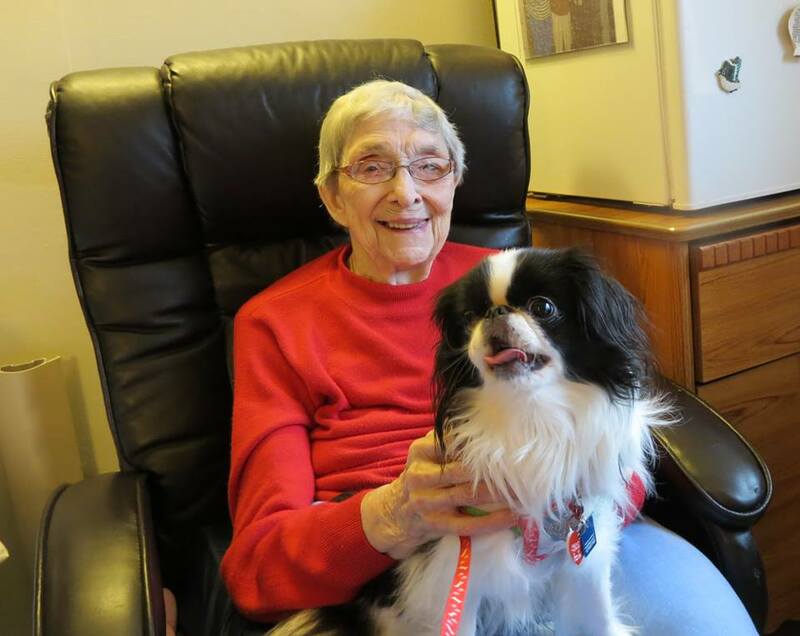 Katie spread smiles and joy and helped folks with emotional healing at her local nursing home and rehab facility. 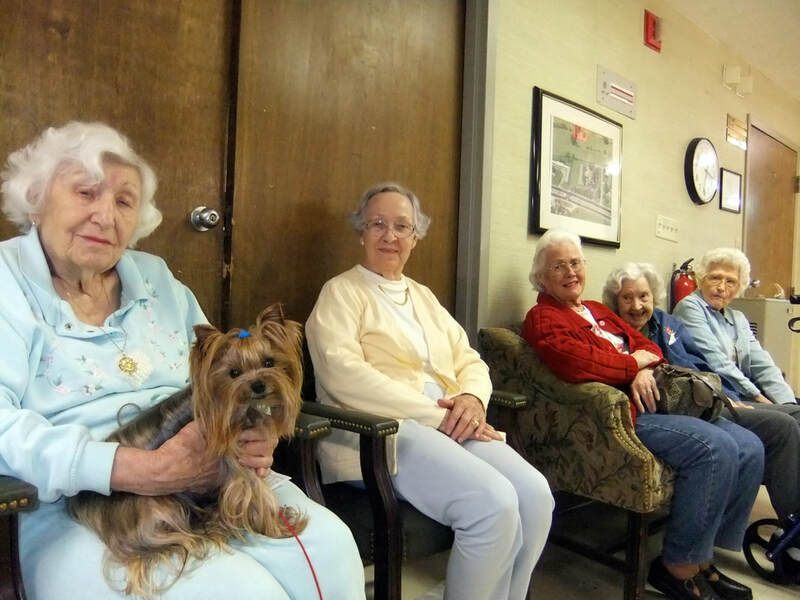 She especially enjoyed the company of Ms. Juanita, Ms. Beverly and Ms. Dell because they always gave her belly scratches and cookies! Katie spent a lot of time relaxing on"The General's" bed as he would share stories with her about his days as a minister and as a child and told her all the wonderful things about his life with his wife. Katie is 4 and a half pounds of wonderful. She and her Mom have been very grateful for the free eye exams offered each year. At a recent visit and exam, it was discovered that Katie has very limited vision up close and so therapy visits would be less enjoyable for her because she could no longer see the patients very well. It was a difficult decision to make, but she and her Mom are very glad for the two + years they were able to make people smile. Katie, also known as "Katie Bug" is living out her retirement as the boss of the house over her sister KiKu, a retired therapy dog, and her brother KaeJae, the world's cutest Jack Russell terrier. It is time for Jessie to retire. It has been a wonderful and rewarding experience and Jessie made many friends along the way. 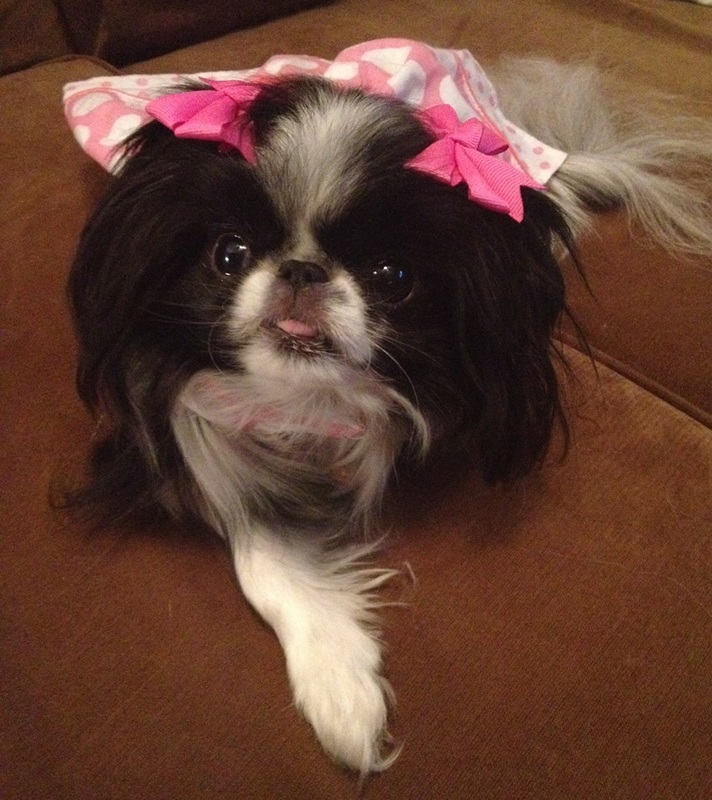 At Ashley Glen, we were eagerly awaited to sit and chat while getting a good belly rub in the process. And the children at the library had lots of stories to tell. 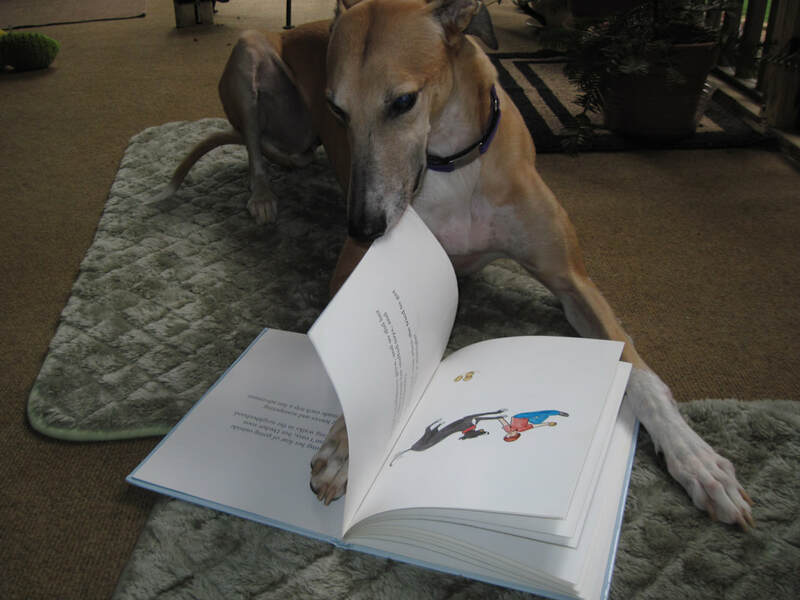 Jessie always listened intently with closed eyes, but when she heard the word "kitty" her ears always popped up and she made sure the cat stayed in the story book and wasn't going to come out. Jessie had a great partner in her friend Phoenix and together they made a phenomenal visiting team.